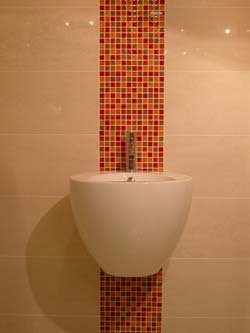 Mosaic tiles can be used to design a unique and individual pattern on tiled walls when used in conjunction with larger tiles. They are available in a wide range of colours, textures and finishes to suit traditional and contemporary tiled rooms. 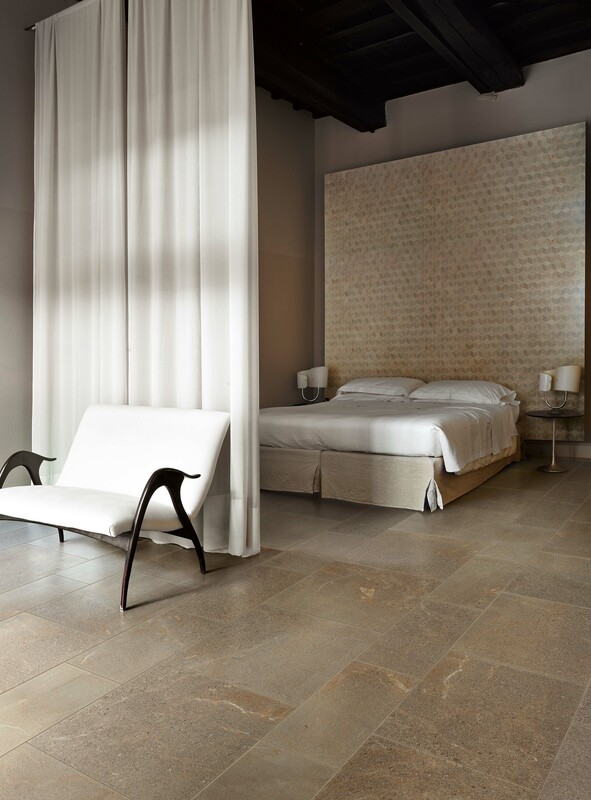 They can also offer a way of introducing chic designer tiles to a space at an affordable cost by combining them with inexpensive large porcelain tiles. 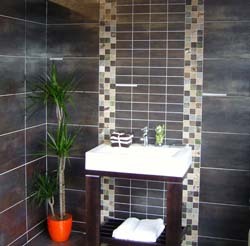 Mosaic tiles are simply very small tiles that are usually supplied on a special mesh backing for ease of installation. They are available in all the standard materials that you would expect of regular tiles such as ceramic, porcelain and natural stone of various types. They also come in glass and meta,l or metal-effect, so are enormously versatile when it comes to creating different pattern, design and colour combinations in a bathroom or kitchen. They are especially suitable for using with larger tiles to inject individuality into what might otherwise be very plain walls. Because of their size they can be used to enhance, highlight or border almost any structural or other type of feature. Mosaic tiles are often available in the same range as much larger tiles so the same tile colour and texture can be used to create subtle designs for those who do not want an eye-catching design or colour, but they are much better used to create vibrant, original designs, If you are not quite brave enough to bright colours in your main bathroom or kitchen then try using them in a small cloakroom where an interesting, individual look might be better appreciated. One of the advantages of mosaic tiles is that they are easy to fit in small, awkward places so a cloakroom is, perhaps, the perfect place to start to discover how they can transform a room. Installing mosaics if much quicker than you might imagine because they are supplied on a mesh backing sheet already accurately spaced out. They do not have to be installed one-by-one unless you choose to do so to make a particular pattern. The best approach to designing a layout using mosaics is to focus on an area that you wish to highlight – this might be a border at waist-height or one close to the ceiling. Alternatively, it could be a wide vertical strip running centrally behind the bathroom sink from floor to ceiling. These types of wide vertical panels are particularly easy to install if you make the width of the border the same width as the mosaic sheet so that you do not have to divide up sheets. But equally with a bit more effort vertical panels or horizontal borders made up of 3 or 4 regular sized mosaic tiles (or 1 or 2 of the larger size) can look extremely effective and individual. When using horizontal borders or vertical panels of mosaic tiles, especially in a contrast colour, it is essential that they are perfectly straight and level. The mosaic tiles within a sheet are, fortunately, perfectly square but each whole sheet or section of a sheet must be laid out very accurately for a professional finish. Also watch out that you don’t apply too much pressure to one side of a sheet, which can cause mosaics on the other side to lift up off the wall behind. Use a large spirit level and wooden battens to mark out the edges of the mosaic section for a perfect result. Mosaic tiles can be used for narrow borders, shower areas, bath surrounds or even for a whole bathroom but because of the high proportion of grouting to tiling be aware that the effort to keep the grouting looking clean in a shower area will be much more than for large tiles. If this is a concern for you (particularly if you live in a hard water area) then reserve the mosaic detailing for areas that are not drenched in water on a daily basis. Another interesting use for mosaics is to use natural stone mosaics as a border with large porcelain or ceramic tiles. This not only saves on cost but introduces a slightly less textured natural look without too many variations in colour. Always choose the large tiles first as these will dominate the design theme of your room, then select from the wide range of mosaic tiles to add a vibrant contrast, a different texture or simply an interesting design effect. Whether your large tiles are natural stone, ceramic or porcelain tiles, there will be a mosaic tile to complement them.